When I started this blog back at the end of 2010 I really just did it for fun. At that time I wanted to make sure it contained useful information and was non-commercial in nature. Then I went back into business for myself in 2012. Because I was mostly contracting to machine builders and integrators and had as much work as I wanted, most of the posts were based on the jobs I was doing or whatever technical things I thought of. By 2014 I was spending a lot of my time teaching classes for Automation Training, so quite a few posts mentioned them and some of my travels. Now that I’ve transitioned into providing training at my own facility, of course I am driven to mention more of my stuff on the blog. That certainly wasn’t the original intent when I started, but so be it. That is mostly what I am involved with at the moment. So this is a pretty important week for me. My first student for my new course is doing two days this week, Monday and Tuesday. Because he gets random days off, he can’t take all 5 days consecutively. That’s one of the advantages of having my own facility, I can be flexible. 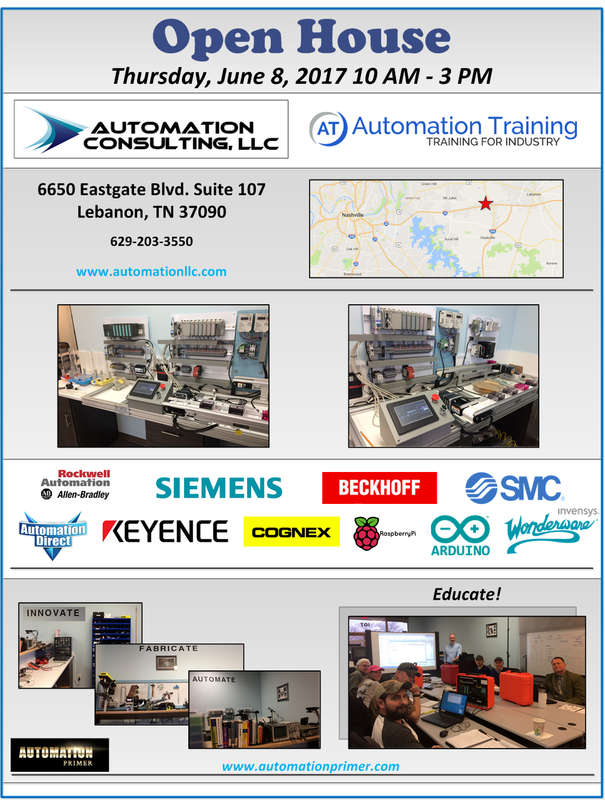 Tuesday evening the owner of Automation Training is coming down from Canada, both for my open house and for a meeting with another important customer/client of mine, Automation NTH. We will be discussing some cooperative ventures that hopefully will benefit all three companies. Then Thursday is my open house itself. If you live in the Nashville Tennessee area I’d love to have you visit! Of course there will be food, and several automation vendors will be here to answer questions. I wish I could say you could see “My Little Factory” in operation, but I’m afraid that’s still a few months down the road. I still don’t even have my pick and place cylinders. Actually I do have the gripper cylinders, but no gripper fingers to attach to them yet. For those of you who were looking for some good technical content this week, again I apologize, but I do have a post on Unitronics, written by Ryan McCarthy, ready to go. I also will be writing a post on machine vision showing some of the cool stuff Mapvision does. I was fortunate enough to get to do a quick consulting job for them last week and got some great pictures.